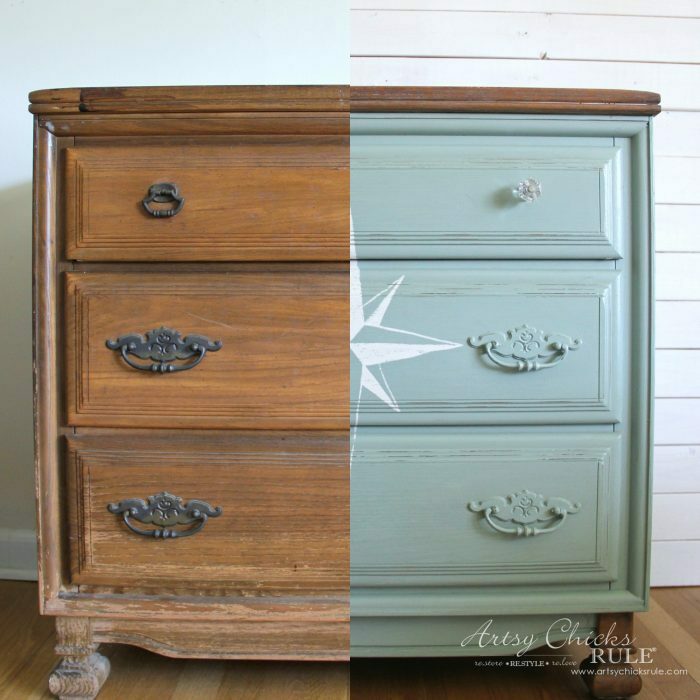 From blah to beauty! 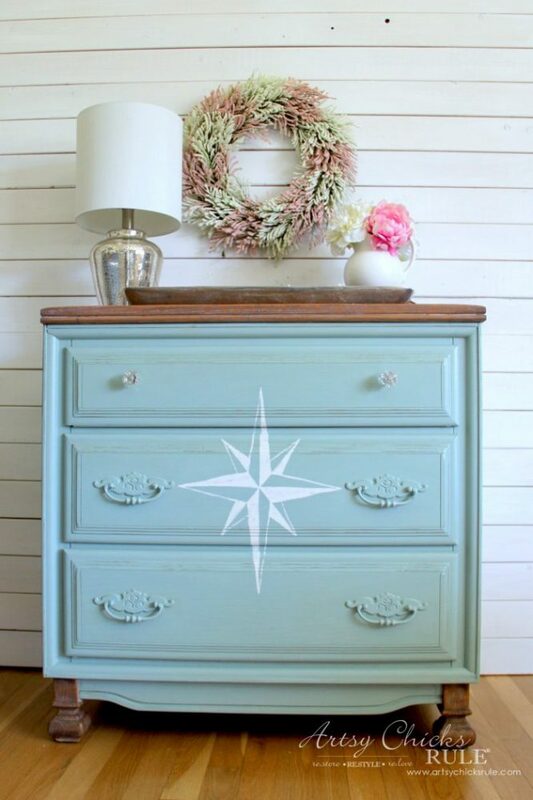 This ReStore compass rose dresser is a stunner now! 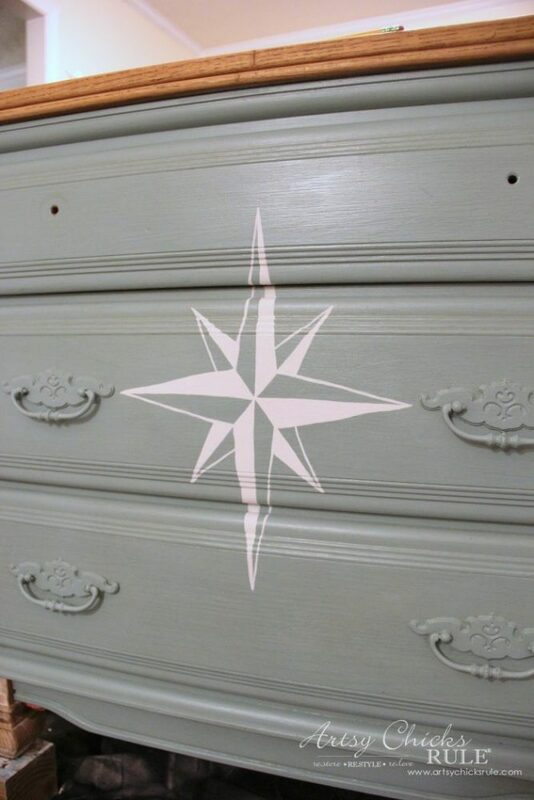 An awesome $20 find from the ReStore that I turned into a compass rose dresser. I was so excited to find this as it’s really hit and miss out there these days. 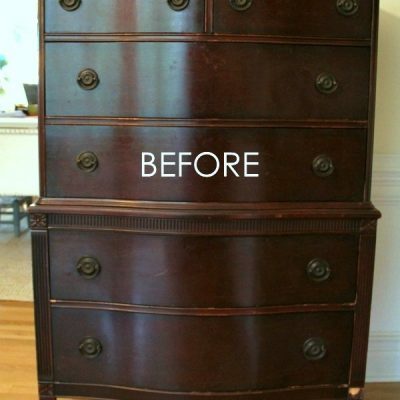 It was in pretty yucky shape but it was solid and the drawers were perfect. It has quite a bit of damage outside but the inside looks almost brand new. As I was giving this little piece the once over, a nice lady came up and said “you know, you could take that home, paint it and make it a really nice piece”. Take a look at that top….eek. 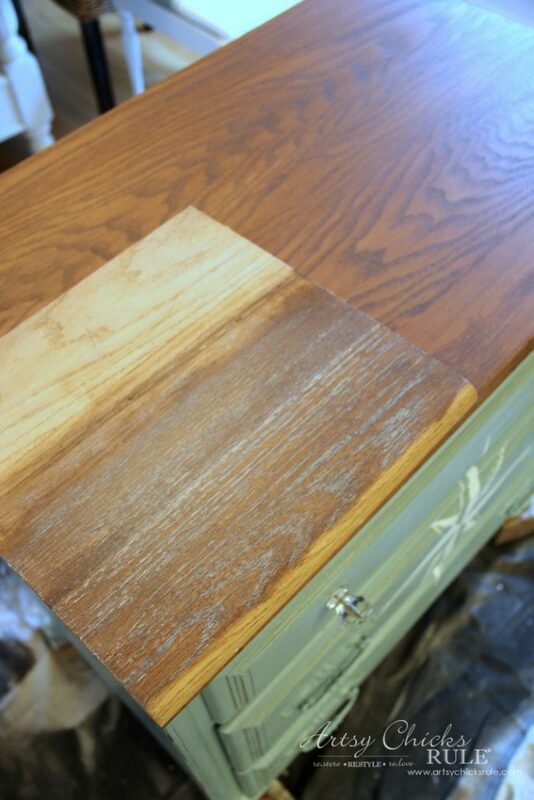 Well, I got busy removing the finish from the top with my favorite stripper, Citristrip. 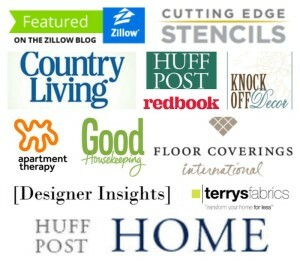 I’ll include a few affiliate links to the products I used for your convenience. See my disclosure here. 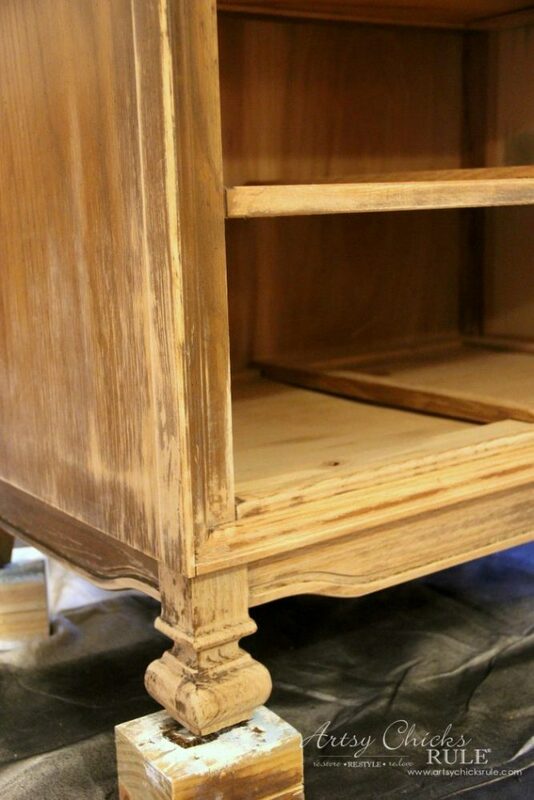 And the rest of the dresser…. I had to sand quite a bit to remove loose finish. 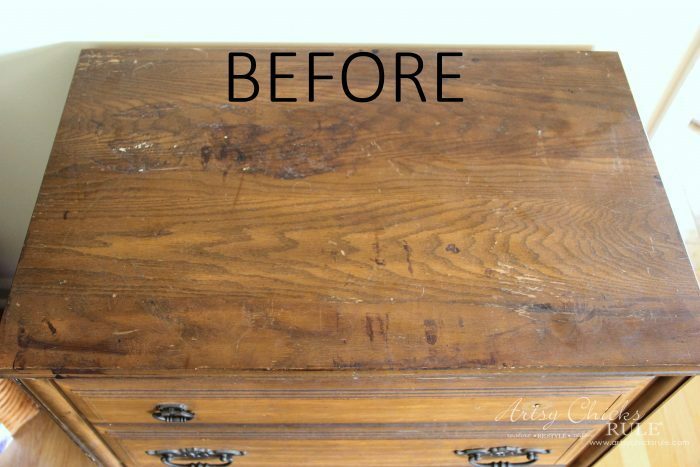 I actually painted the dresser and let it sit for about 2 weeks as I tried to decide what to do with the top. 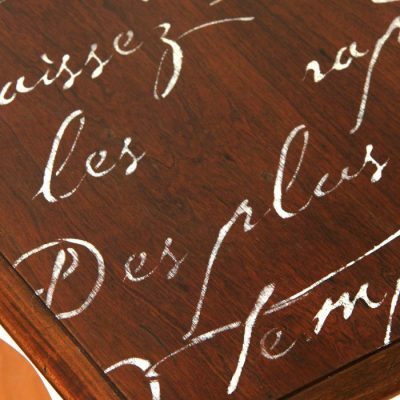 I had just completed this little french script table with a nice, rich, stained wood top so wanted to do something different here. I considered doing a white wash over that wood but I was afraid it was just a bit too orange. 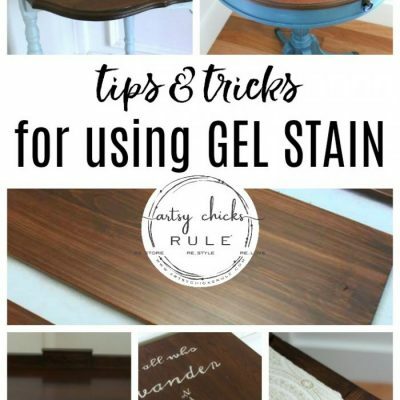 So in the end, I finally decided to conceal some of that orange by using a walnut stain over top. 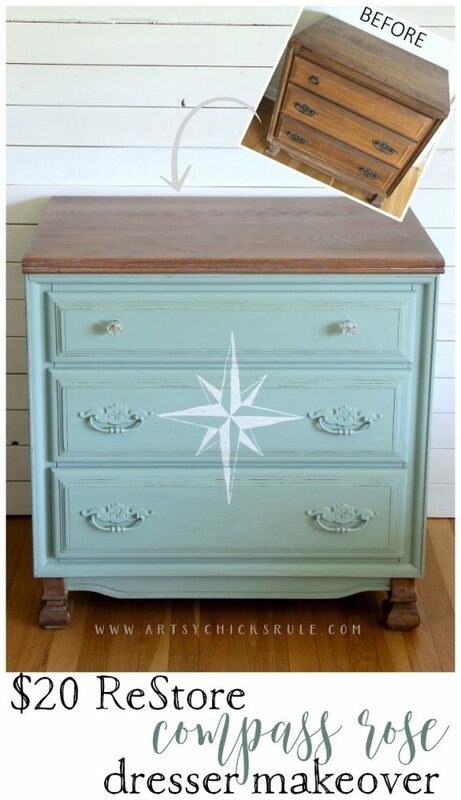 I used General Finishes Gel Stain on my pretty, little compass rose dresser. This is one coat. I love this stain. It’s so easy to apply. Just use an old rag and rub it in and wipe away the excess. Wowzers!! 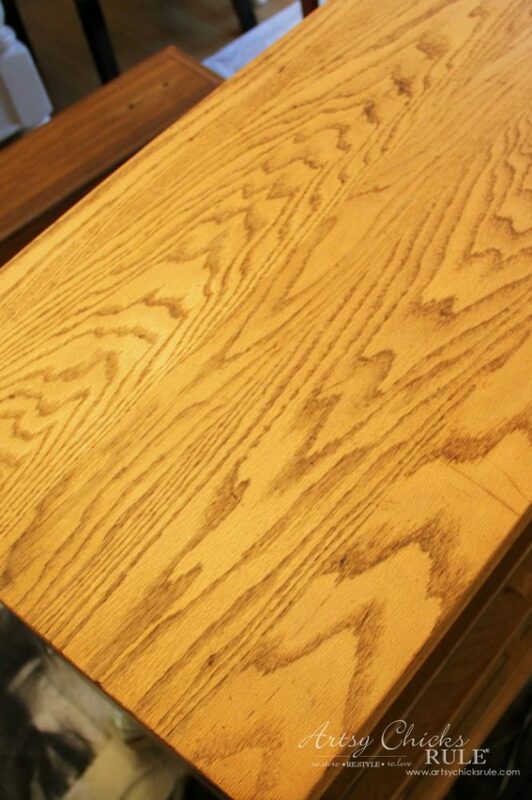 Look at that gorgeous grain. Love! And than I let is sit a few more days because that was just not doing it for me on this particular piece. As gorgeous as that top was now, it just didn’t “go” with the rest, to me anyway. 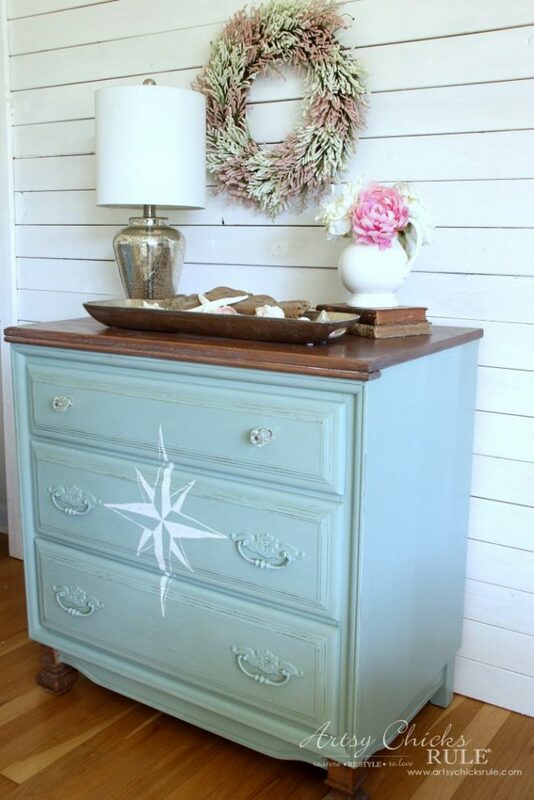 I used Annie Sloan Chalk Paint in Duck Egg Blue. I love this color. Obviously, I’ve used it quite a bit. Here it is on my prized and very loved garage sale secretary desk, rescued patio table, thrifty end table, ReStore painted upholstered chair and even my kitchen island. I sealed the entire piece with a poly top coat instead of wax. I hadn’t originally planned to add a graphic to the front. 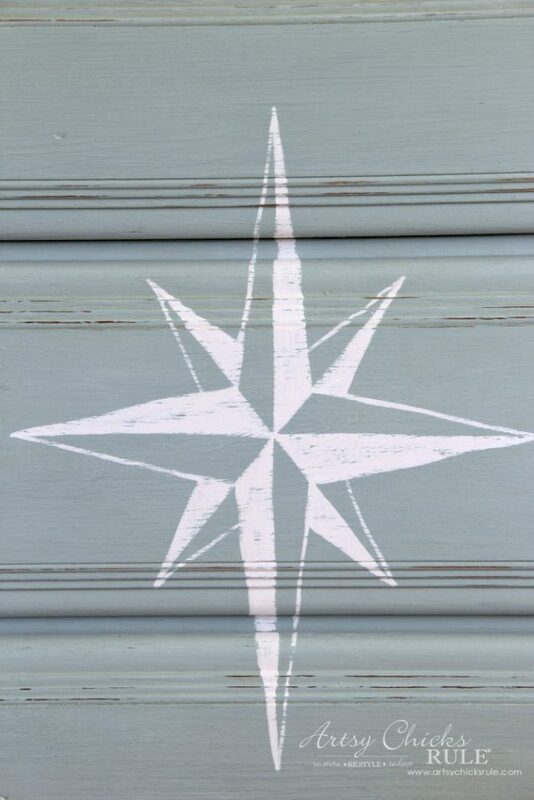 If I had, I’d have waited to apply the poly until after I added the compass rose. As you can see above, I tried using one of my favorite ways to transfer graphics but it didn’t work out. 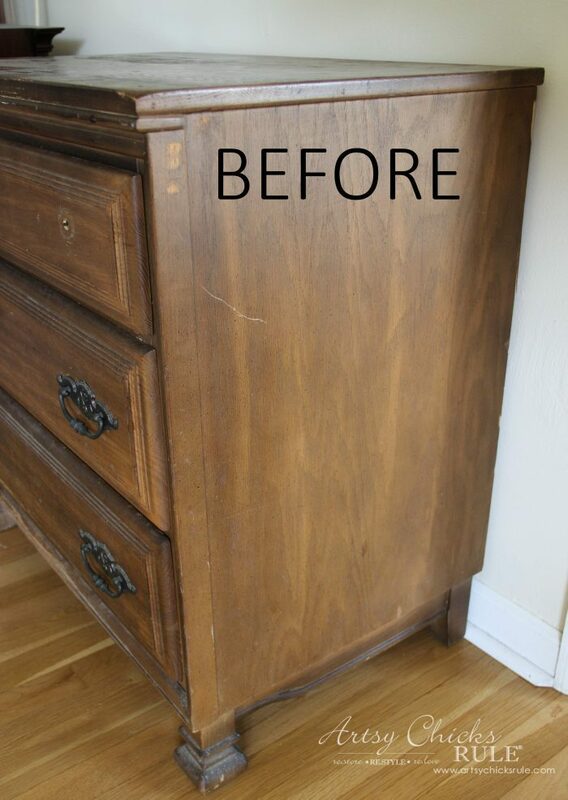 The drawers were really presenting a problem with all of their lumps and bumps. 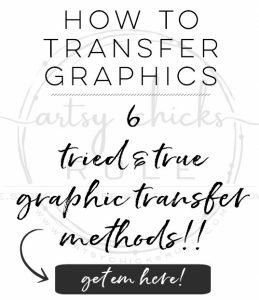 So back to the drawing board….and back to my old, tried and true way of transferring graphics. 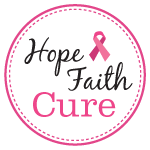 You can download it here …. You can also save to a thumb drive and take it down to your local print shop, Office Max, etc. They will print it onto a clear sheet for you. 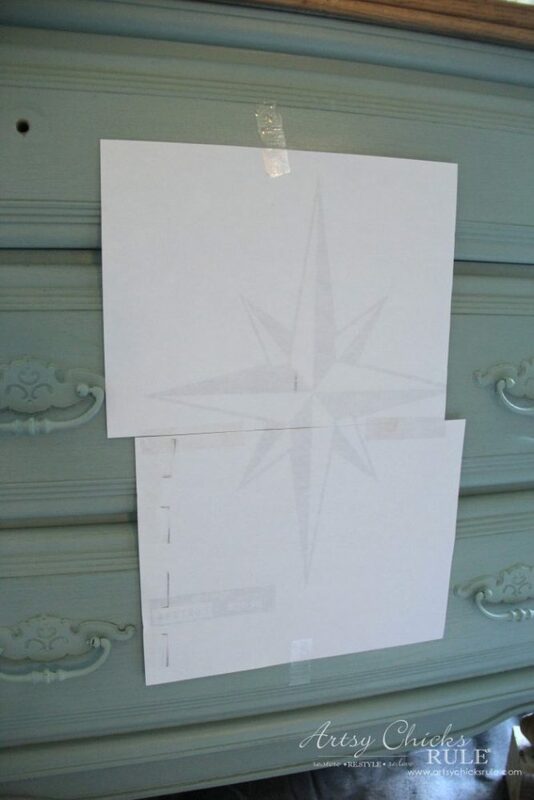 I did find these transparency film sheets for inkjets and may give them a try. 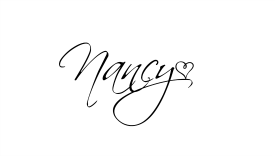 MUCH easier to print your own instead of running up to Office Max every time. 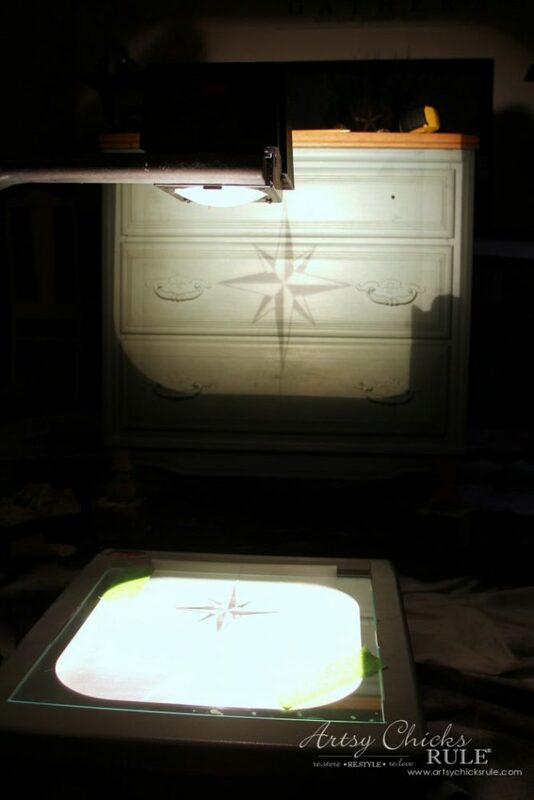 All you do is position it where you want it and then just trace around the design…. I used a white watercolor pencil since I was using white paint to paint in my design. I used a bright white paint color and a script liner brush. 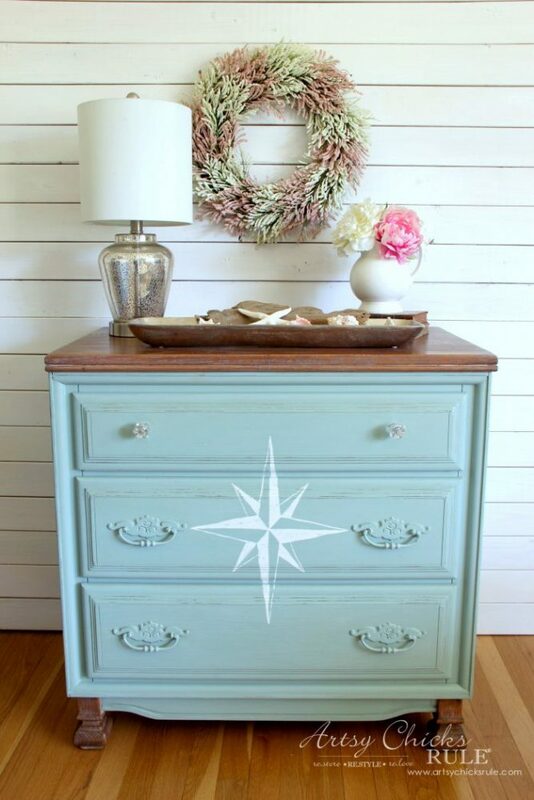 You can see below I made sure to paint the compass rose even in the insets of the dresser/drawers. 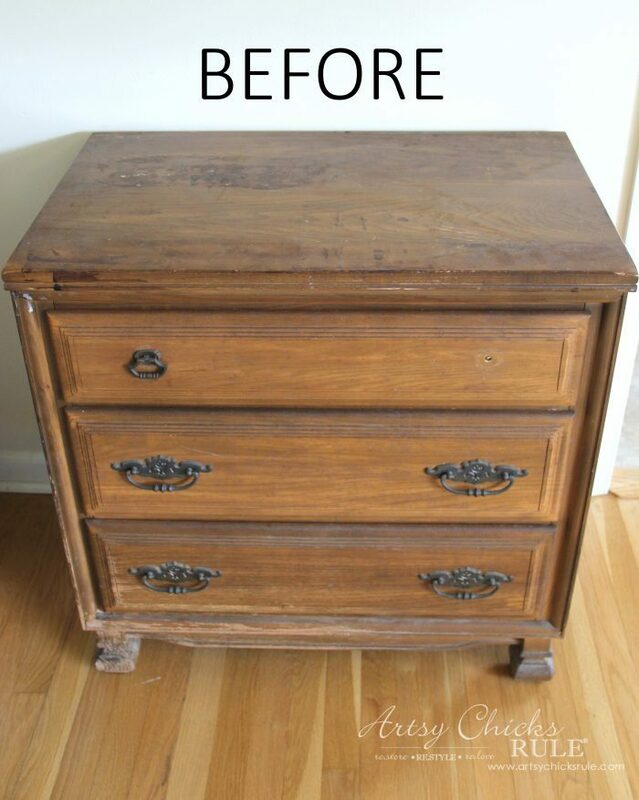 And then I lightly sanded to distress it and the dresser just a bit. 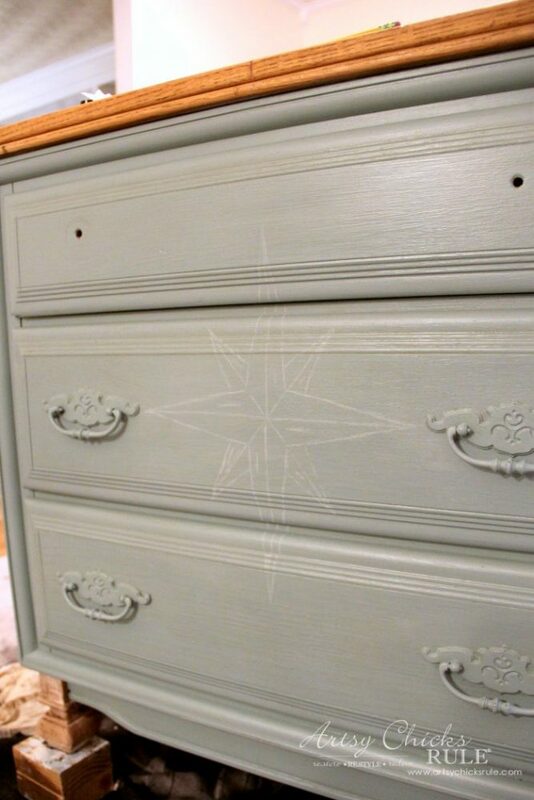 I applied another light coat of poly on the front of the compass rose dresser. So that top was still bugging me. What to do? Weathering it in some way was still what was calling to me. 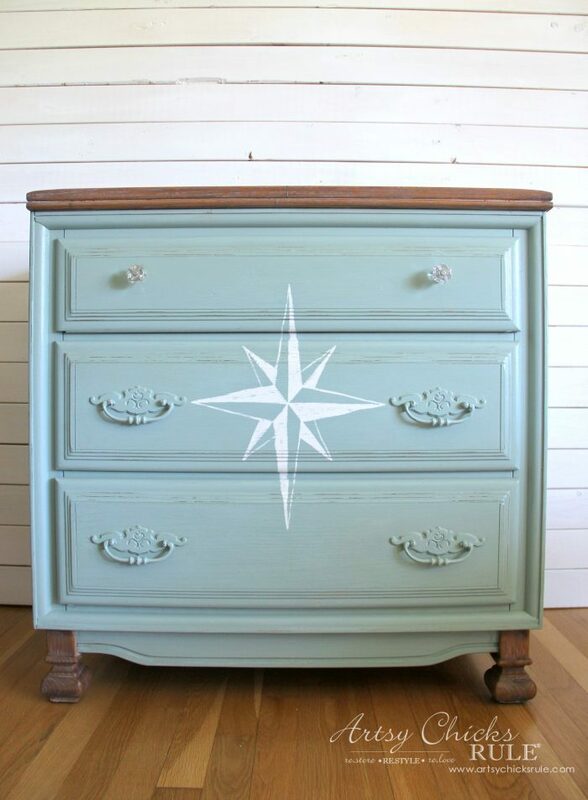 The paint, the compass rose, the overall look of the dresser was begging for a bit of “age” on top. So I thought, why not white wax? I pulled out a scrap of oak leftover from when we did our stair treads. I stained it the same color and applied the white wax. Wow, yippee, yes!!! That’s it. That is it. I didn’t get quite the same look when I applied it to the top, however. It wasn’t quite as rough so didn’t pick up as much of the white wax as I’d hoped it would. 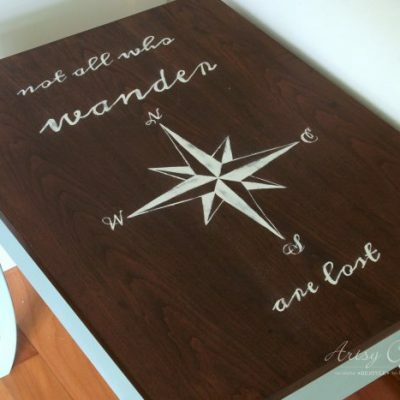 BUT…I still liked it better than the plain stained wood, for this piece anyway. Buffed up to a nice sheen and done. 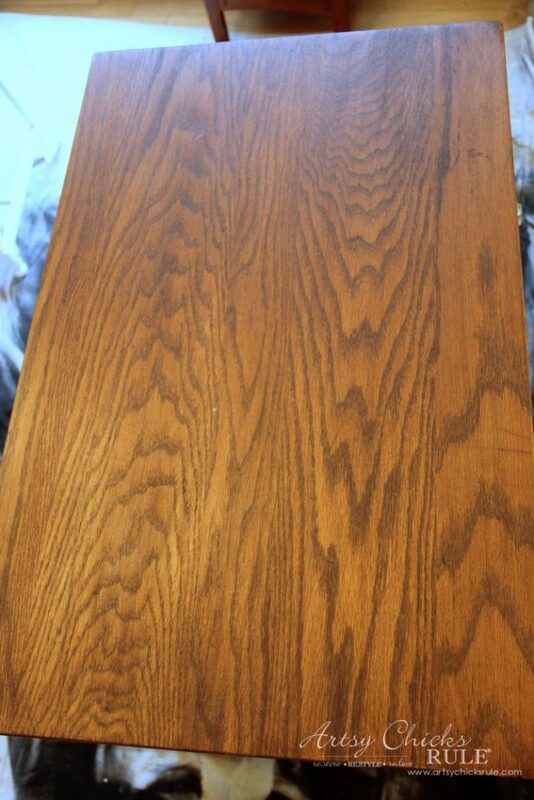 A nice medium between stained natural wood …. 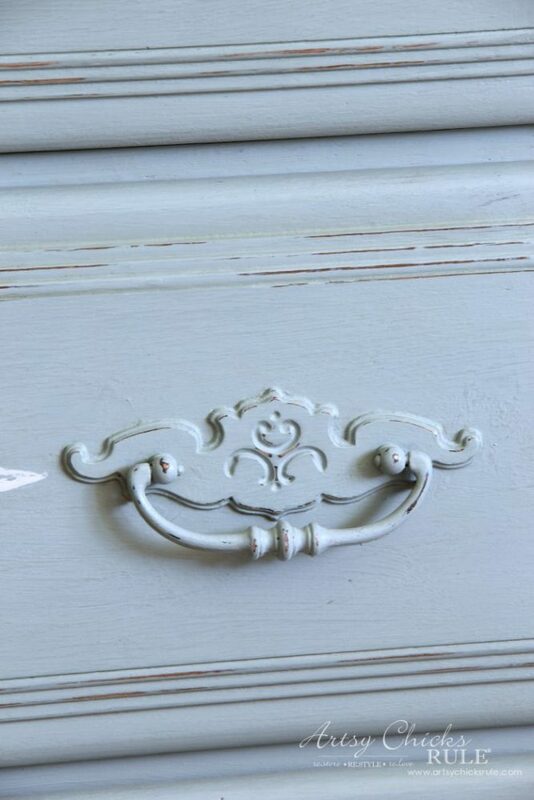 and a bit of soft weathering to go with the style of the rest of the dresser. The feet got the same treatment. Which, by the way, I decided to not paint. I just thought they stood out and were so decorative and pretty, they deserved to continue to stand out. So I didn’t paint them along with the rest of the dresser. 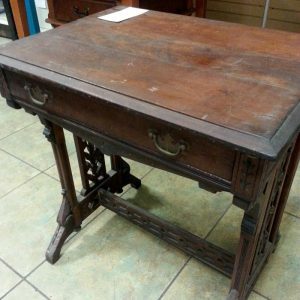 Why pay crazy prices for brand new furniture when you can find treasures like this? 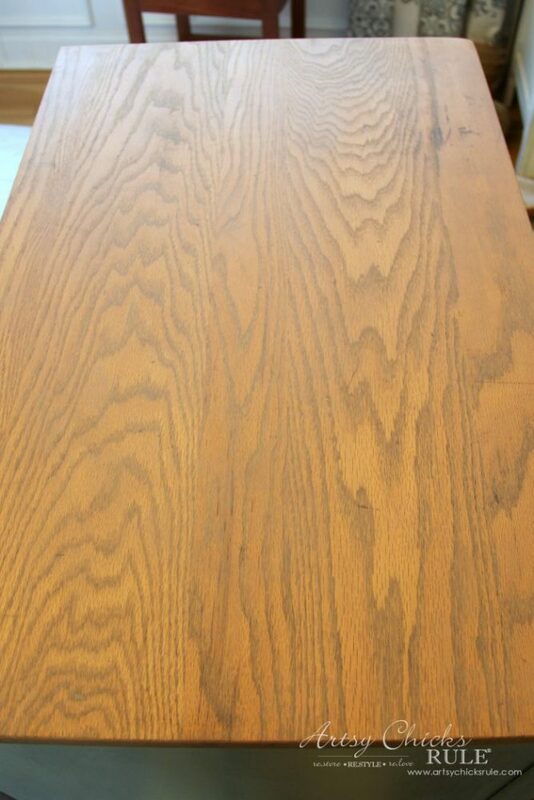 $20…solid wood, heavy, well made. 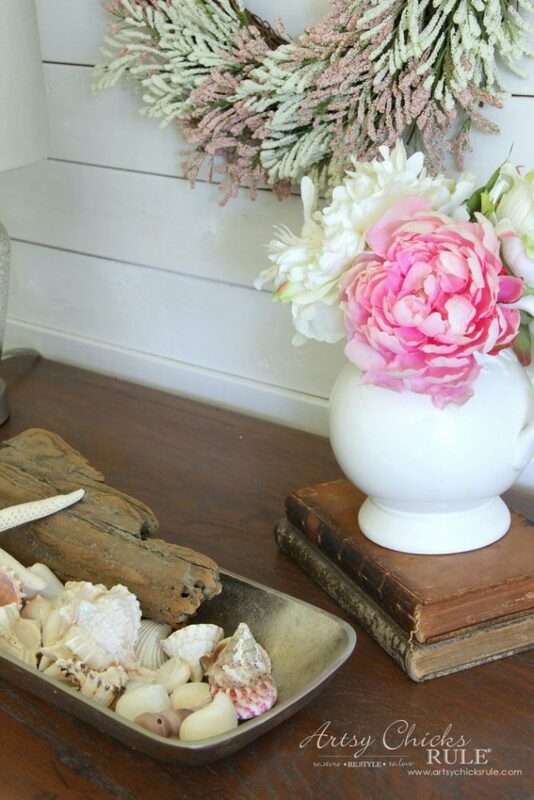 I hung one of my favorite DIY spring wreaths on the wall…goes so nicely, I think! You can see the top a little bit here…. He’s really a super sweetie…love him. So there you have it. 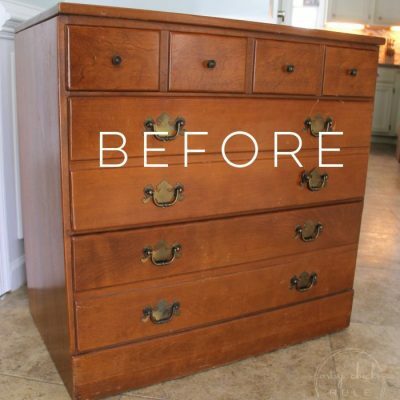 Go shop the ReStore! If yours are like mine, you never know what you’ll find. BUT it’s so worth it to give it a check every now and again. What a lovely make-over. 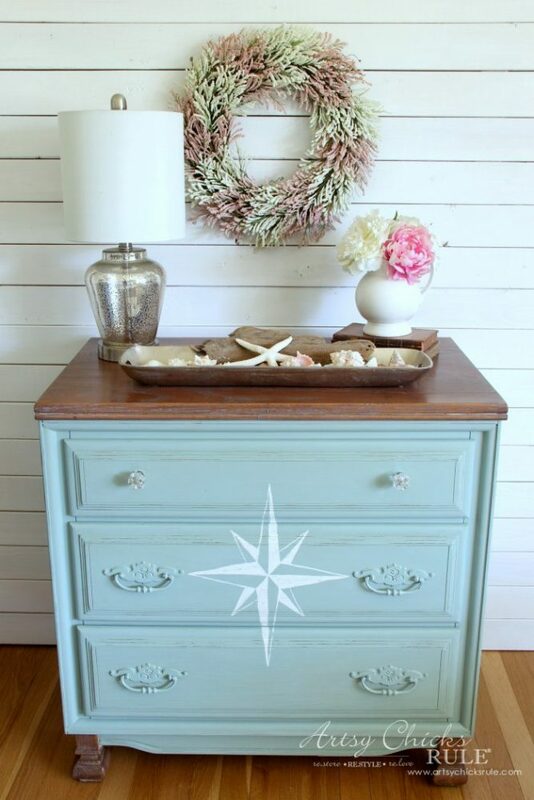 I have a 3 drawer dresser much like what you have; (free curb side find) wondering what I could do with it and now I know; paint on bottom and stained on top. Thank U. Beautiful make over! I love that you left the feet unpainted, it really ties in with the top. 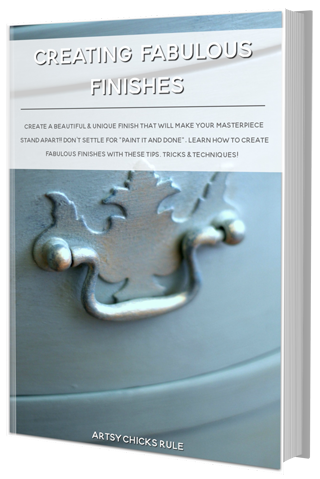 I appreciate the step by step process as I am relatively new with painting furniture. Ryder is beautiful! 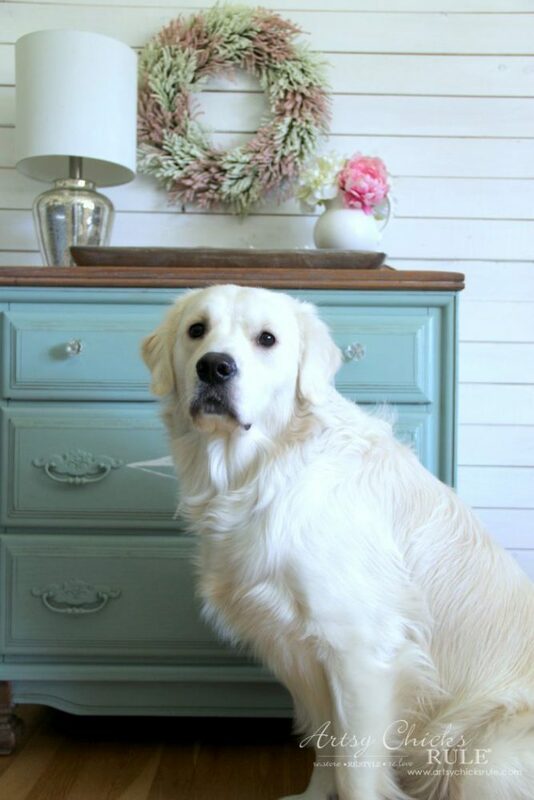 Is he a cream colored Golden retriever? I love a good find like that. You did a beautiful job. 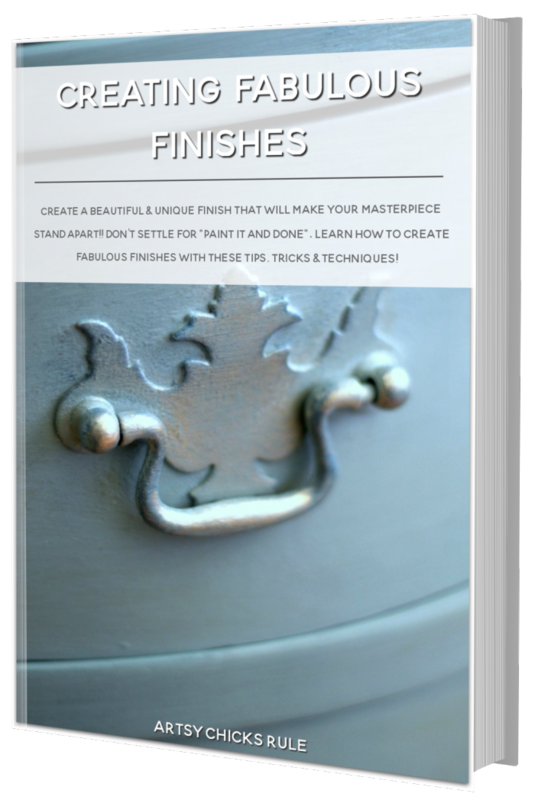 Beautiful piece of furniture. You do great work. You and Christy are my fav. Nice job. 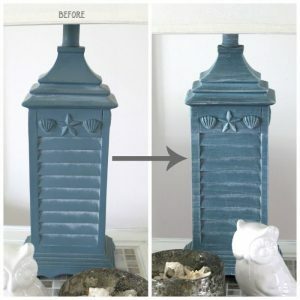 I love Restore too, have acquired several beauties there. 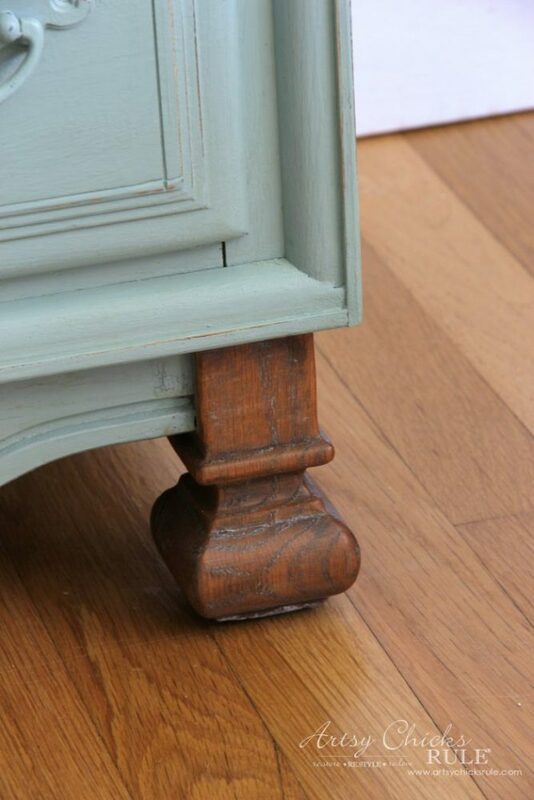 I really like the unpainted feet on this bureau. 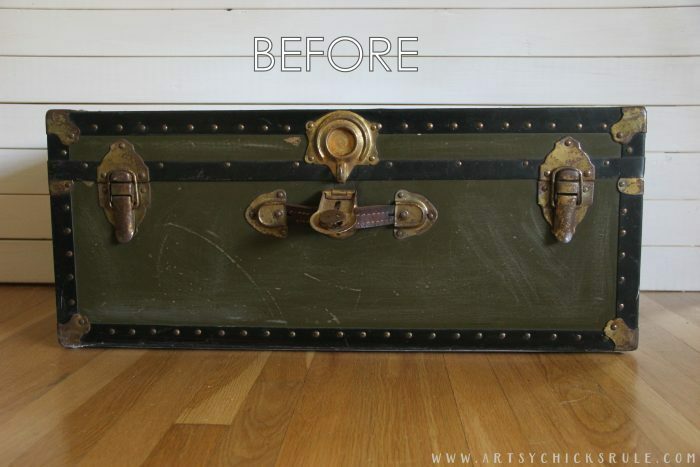 Definitely looks much improved and someone will love it! You gave it a second life! 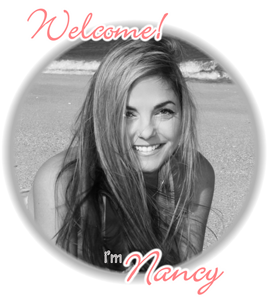 Such a lovely makeover, Nancy! 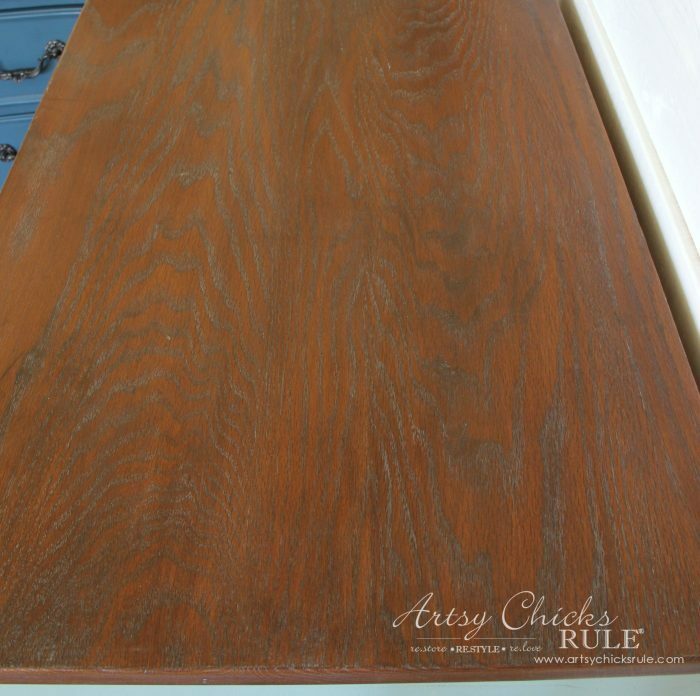 Love the duck egg paired with the white waxed stained wood. I really like the look of the feet kept stained rather than painted. I wonder what it would have looked like if you had left the little skirt at the bottom unpainted as well? Just a thought . . . I think it was a great idea that you left the feet unpainted! They are so unusual looking that they pop against the paint color! 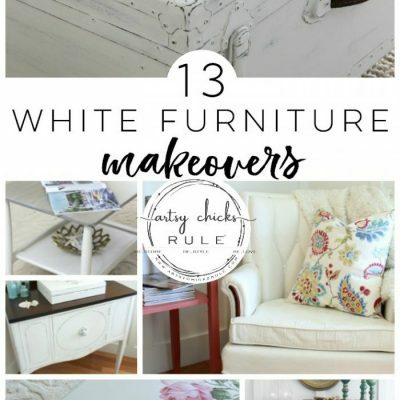 Nancy,you always do a wonderful job on your furniture makeovers and this one is no exception! It’s gorgeous!! 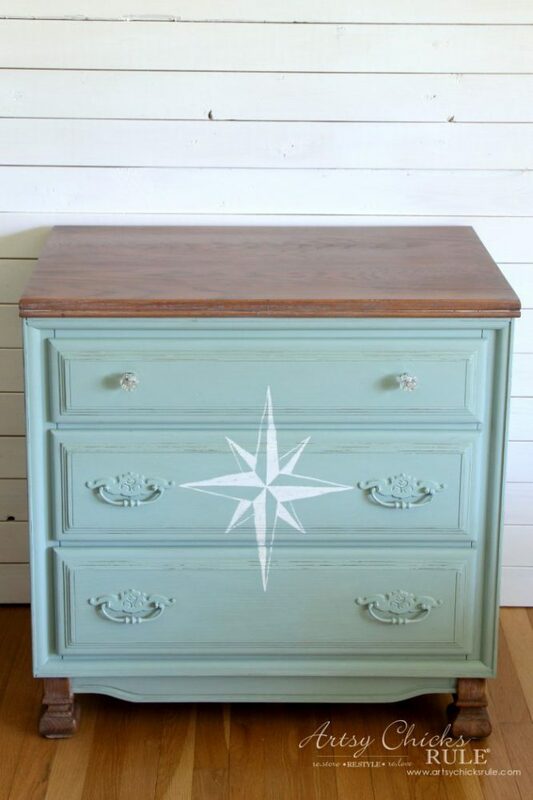 That chest was really a steal for $20.00 and it turned out so cute. I personally like the legs unpainted to match the top of the chest.